Spikelets always unisexual, the female 1-flowered consisting of an ovary contained in a bottleshaped utricle and subtended by a glume; the male consisting of 1–3 stamens arising from a low receptacle subtended abaxially by a glume and actually represents 3 1-staminate flowers. The genus was monographed by Kükenthal [E.P. 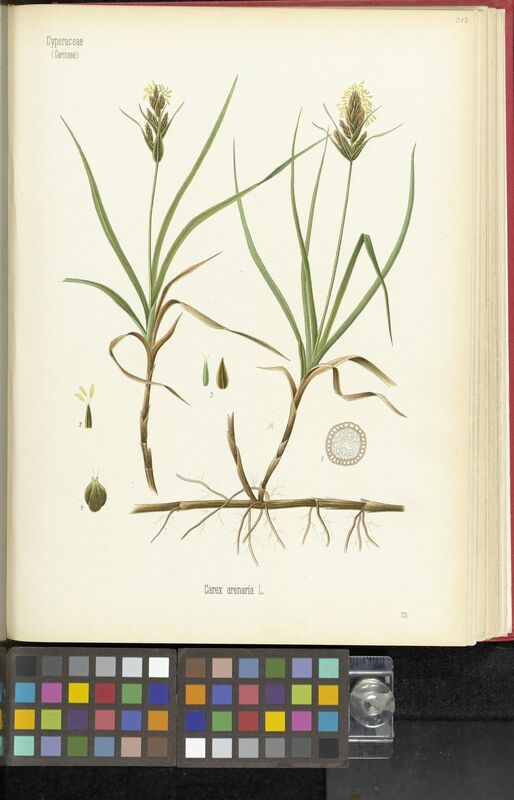 4, 20 Cyperaceae-Caricoideae: 1–824 (1909)] who divided it into 4 subgenera: Primocarex Kük., Vignea (P. Beauv.) Nees, Indocarex Baill. and Carex and although these are still often used (e.g. by Haines & Lye) doubt on the naturalness of the first was first expressed in 1936 and now usually only Carex and Vignea are recognised. If the plant has several to many elongate sometimes sessile but usually pedunculate spikes as in Fig 66, p. 440. it is easiest to go direct to couplet 15 in the key. Inflorescence a slender to large panicle with unisexual flowers or reduced to a single spike; main axis with a succession of bracts, each of the lowest subtending utricles enclosing a female floret; rachilla with an apical partial spikelet of several glumes each subtending a male floret. About 12 species, mostly in southern Africa, a few extending to Ethiopia and 2 in Madagascar. Carex algida Turcz. ex V.I.Krecz. Carex aphanolepis Franch. & Sav. Carex appendiculata (Trautv. & C.A.Mey.) Kük. Carex argunensis Turcz. ex Trevir. Carex argyrolepis Maxim. ex Franch. & Sav. Carex ascotreta C.B.Clarke ex Franch. Carex barrattii Torr. ex Schwein. Carex × bengyana H.Lév. & L.C.Lamb. 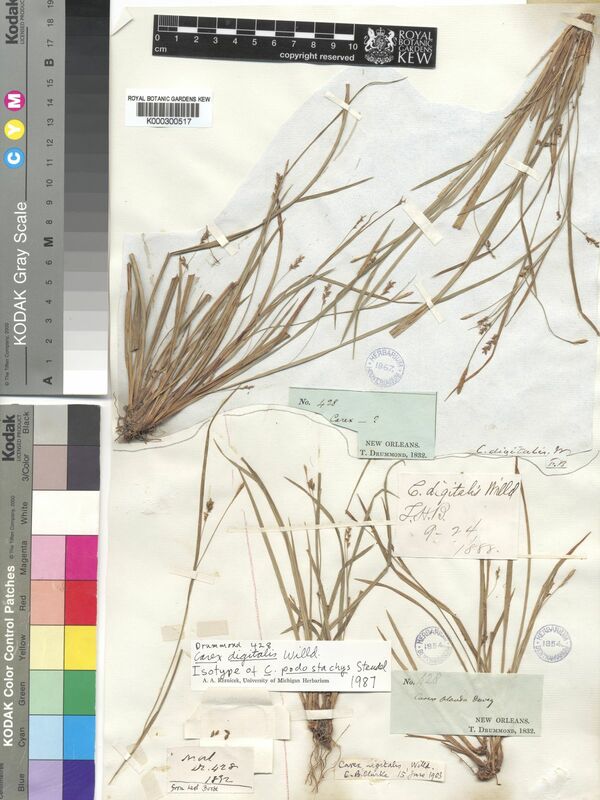 Carex bicknellii Britton & A.Br. Carex bicolor Bellardi ex All. Carex boliviensis Van Heurck & Müll.Arg. Carex bonariensis Desf. ex Poir. Carex capricornis Meinsh. ex Maxim. Carex castanostachya K.Schum. ex Kük. Carex catamarcensis C.B.Clarke ex Kük. Carex chrysolepis Franch. & Sav. Carex conferta Hochst. ex A.Rich. Carex coulteri Boott ex Hemsl. Carex crawei Dewey ex Torr. Carex cuchumatanensis Standl. & Steyerm. Carex depauperata Curtis ex Woodw. Carex dickinsii Franch. & Sav. Carex duvaliana Franch. & Sav. Carex × elanescens Cif. & Giacom. Carex eriocarpa Hausskn. & Kük. Carex × ferdinandi-sauteri Asch. & Graebn. Carex × figertii Asch. & Graebn. Carex filipes Franch. & Sav. Carex × firmior (Norman) Holmb. 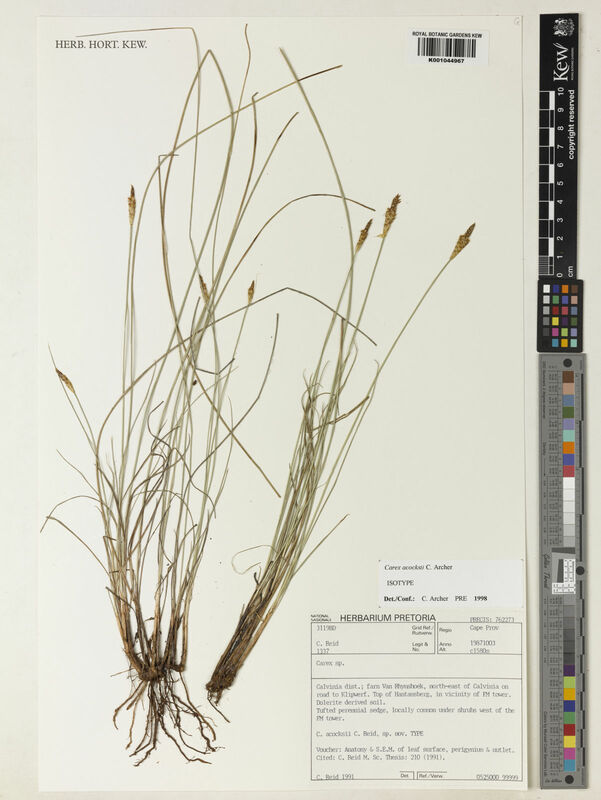 Carex × flavicans (F.Nyl.) F.Nyl. Carex flavocuspis Franch. & Sav. Carex forficula Franch. & Sav. Carex gemella Hochst. ex Steud. Carex glareosa Schkuhr ex Wahlenb. Carex gmelinii Hook. & Arn. Carex hakonensis Franch. & Sav. Carex heleonastes Ehrh. 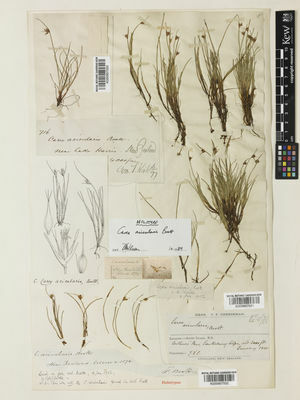 ex L.f.
Carex hilaireioides C.B.Clarke ex Kük. Carex hochstetteriana J.Gay ex Seub. Carex huehueteca Standl. & Steyerm. Carex idzuroei Franch. & Sav. Carex kiotensis Franch. & Sav. Carex kitaibeliana Degen ex Bech. Carex knorringiae Kük. ex V.I.Krecz. Carex koestlinii Hochst. ex Steud. Carex koyaensis J.Oda & Nagam. Carex krascheninnikovii Kom. ex V.I.Krecz. Carex × kuekenthaliana Appel & A.Brückn. Carex kurdica Kük. ex Hand.-Mazz. 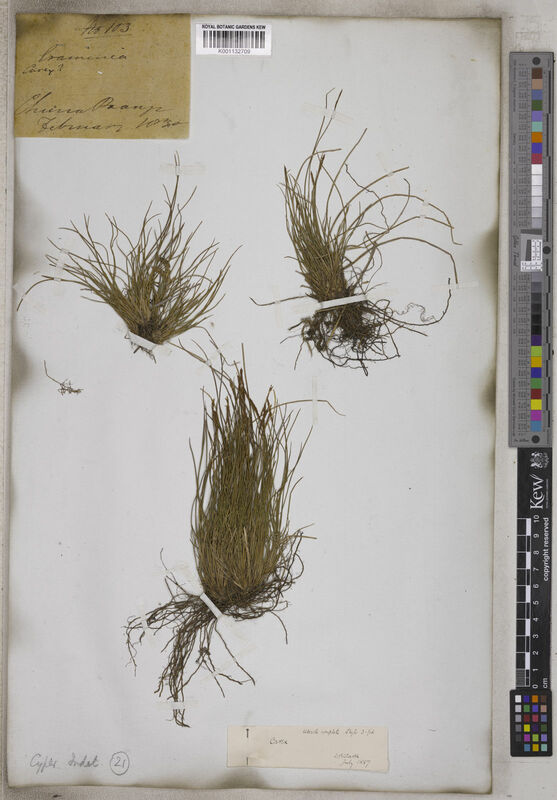 Carex ledebouriana C.A.Mey. ex Trevir. Carex lonchocarpa Willd. ex Spreng. Carex × luteola (Rchb.) Sendtn. Carex macrocephala Willd. ex Spreng. Carex mairei Coss. & Germ. Carex manciformis C.B.Clarke ex Franch. Carex mariposana L.H.Bailey ex Mack. Carex melanocarpa Cham. ex Trautv. 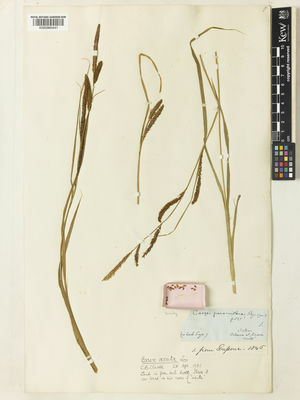 Carex melanostachya M.Bieb. ex Willd. 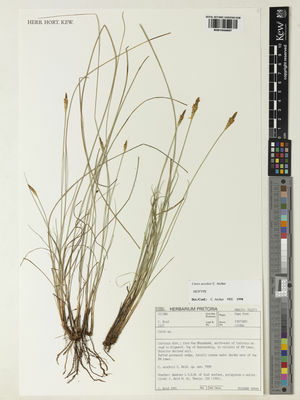 Carex mertensii J.D.Prescott ex Bong. Carex minutiscabra Kük. ex V.I.Krecz. Carex nairii Ghildyal & U.C.Bhattach. Carex neochevalieri Kük. ex A.Chev. Carex neohebridensis Guillaumin & Kük. Carex nervata Franch. & Sav. Carex noguchii J.Oda & Nagam. Carex × oenensis A.Neumann ex B.Walln. Carex omiana Franch. & Sav. Carex onoei Franch. & Sav. Carex oxylepis Torr. & Hook. Carex pachygyna Franch. & Sav. Carex pachystachya Cham. ex Steud. Carex paleacea Schreb. ex Wahlenb. Carex × paulii Asch. & Graebn. Carex perraudieriana (Kük. ex Bornm.) Gay ex Kük. Carex planata Franch. & Sav. Carex podogyna Franch. & Sav. Carex polystachya Sw. ex Wahlenb. Carex porrecta Reznicek & Camelb. Carex × prostii Chass. ex P.Fourn. Carex pseudoaperta Boeckeler ex Kük. Carex pycnostachya Kar. & Kir. Carex reinii Franch. & Sav. Carex rochebrunei Franch. & Sav. Carex × rotae De Not. Carex ruralis J.Oda & Nagam. Carex sahnii Ghildyal & U.C.Bhattach. Carex sedakowii C.A.Mey. ex Meinsh. 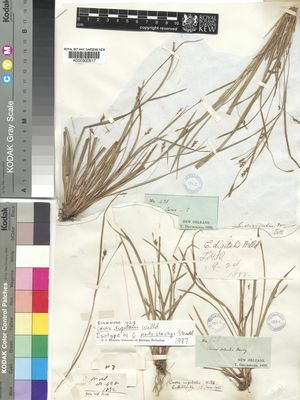 Carex shiriyajirensis Akiyama ex Tatew. Carex shortiana Dewey & Torr. Carex simensis Hochst. ex A.Rich. Carex songorica Kar. & Kir. Carex sordida Van Heurck & Müll.Arg. Carex spissa L.H.Bailey ex Hemsl. Carex sprengelii Dewey ex Spreng. Carex stenantha Franch. & Sav. Carex stenocarpa Turcz. ex V.I.Krecz. Carex stenostachys Franch. & Sav. Carex stipitinux C.B.Clarke ex Franch. Carex subandrogyna G.A.Wheeler & Guagl. Carex subphysodes Popov ex V.I.Krecz. Carex subspathacea Wormsk. ex Hornem. Carex thurberi Dewey ex Torr. Carex tojquianensis Standl. & Steyerm. Carex tokuii J.Oda & Nagam. Carex torta Boott ex Tuck. Carex tunimanensis Standl. & Steyerm. Carex vesca C.B.Clarke ex Kük. Carex × winkelmannii Asch. & Graebn. Cymophyllus Mack. ex Britton & A.Br. Koopman, J., Smith, C. & Blackstock, N. (2014). Carex tomentosa versus C. filiformis (Cyperaceae): the long-standing debate comes to its happy end Nordic Journal of Botany 32. Kükenthal in Engl., Pflanzenr. 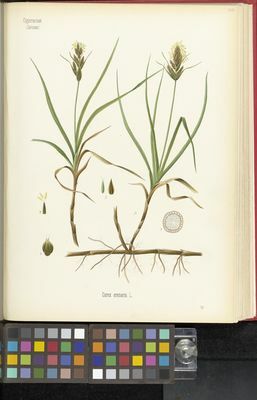 Cyperaceae-Caricoideae: 67–767 (1908).